At the end of each round of Bundesliga fixtures, we have the great pleasure of naming the Man of the Matchday - the one star who has outshone all around them. 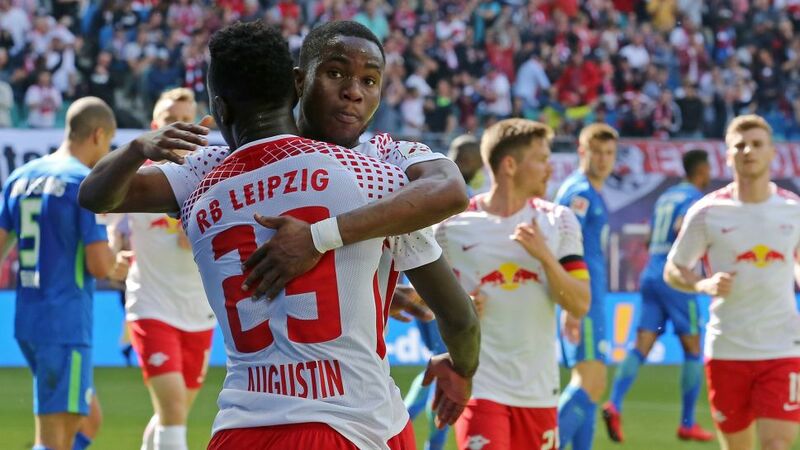 RB Leipzig's Ademola Lookman kept his side's hopes of qualifying for next season's UEFA Champions League alive on Matchday 33, scoring a brace to spearhead a 4-1 victory at home to Wolfsburg. Andrej Kramaric of Hoffenheim underlined his high-class finishing ability with a clinical hat-trick as the Sinsheim outfit saw off Hannover to continue their push for a top-four finish and qualification for the 2018/19 UEFA Champions League. Jadon Sancho became the youngest Englishman to score in the Bundesliga after opening his top-flight account in Dortmund's 4-0 drubbing of Leverkusen. The 18-year-old also served up a pair of delicious assists. Kai Havertz celebrated becoming the youngest player in Bundesliga history to make 50 appearances, with two assists in Leverkusen's 4-1 rout of Frankfurt. It was mission accomplished for Jupp Heynckes in Augsburg as Bayern wrapped up their 27th Bundesliga title and sixth in a row, with five games to spare. James Rodriguez scored one and created two more in Bayern's first-half demolition of Borussia Dortmund in Der Klassiker. With a goal and match-winning assist, Naby Keita was at his twinkle-toed best to inspire RB Leipzig to a first-ever victory over Bayern. Robert Lewandowski scored a hat-trick on Matchday 26 to move onto 100 Bundesliga goals for Bayern, and 142 in all competitions - more than any other non-German to have played for the club. Florian Müller saved Mainz's bacon against Hamburg, and even kept out a Filip Kostic penalty in an unforgettable debut for the 20-year-old rookie custodian. Hertha Berlin goalkeeper Rune Jarstein prevented Bayern from scoring in a Bundesliga game at the Allianz Arena for the first time since May 2015. Roman Bürki took all the plaudits in Dortmund's 1-0 win at Gladbach, after making more saves than any goalkeeper in the Bundesliga so far this season. Marco Reus made his first start following 259 days out with a cruciate ligament tear in Dortmund's 2-0 win over Hamburg. Dortmund debutant Michy Batshuayi scored a brace and supplied the match-winning assist for Andre Schürrle in Cologne. Naldo scored the winner for Schalke against Stuttgart, on the same day he overtook Ze Roberto's record as the Brazilian with the most appearances in the Bundesliga. Leon Bailey's remarkable backheel goal, as well as his assist, stole the headlines in Leverkusen's 4-1 win at Hoffenheim. Simon Terodde celebrated his second debut in a Cologne shirt by heading home deep into injury time for a priceless win over Borussia Mönchengladbach. Pulisic scored a sensational last-gasp winner for Dortmund against Hoffenheim. Bayern striker Robert Lewandowski moved into the top 10 of the Bundesliga' s all-time goalscoring chart following his goal against Cologne. Freiburg's Nils Petersen turned the tables on Cologne, with his sensational hat-trick securing a remarkable 4-3 win from 3-0 down. Serge Gnabry netted from near the halfway line with a quite brilliant strike in Hoffenheim's win against RB Leipzig. Domenico Tedesco masterminded Schalke's sensational comeback from 4-0 down to draw 4-4 at Dortmund in a Revierderby for the ages. With three goals and an assist in the 4-0 win over Hannover, Max Kruse was the star of the show for Bremen. Arjen Robben became Bayern's all-time leading foreign-born goalscorer after finding the net against Dortmund. Bayern's James put in an inspired performance, capped by a sumptuous volleyed goal, on his first start at the Allianz Arena. Leverkusen hotshot Kai Havertz pitched in with three assists in a 5-1 drubbing of Rhineland rivals Gladbach. Chadrac Akolo stepped off the bench to score a dramatic winner for Stuttgart against bottom club Cologne. Mexico's Marco Fabian took to the stands ahead of Eintracht Frankfurt's match against VfB Stuttgart, collecting donations for victims of a devastating earthquake in his homeland. A Pierre-Emerick Aubameyang hat-trick helped Dortmund to a thumping 6-1 victory over against Gladbach. James scored his first Bundesliga goal on his full debut as Bayern breezed past Schalke. Grabbing a brace against Mainz, Lewandowski made history on his 100th Bundesliga appearance in Bayern Munich colours. Bibiana Steinhaus hardly put a foot wrong in becoming the first female referee in Bundesliga history in Hertha's 1-1 draw with Werder Bremen. Nuri Sahin was the brains behind Dortmund's Matchday 2 win at home to Hertha Berlin. A goal and an assist on the opening weekend for Pulisic were enough to send his Borussia Dortmund side top following a 3-0 win at Wolfsburg. Click here for the latest Bundesliga news, views and features!